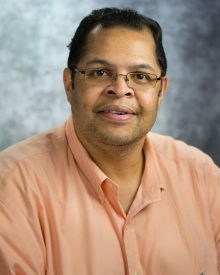 Please join us in congratulating Dr Tan-Lucien Mohammed on his appointment as Professor of Radiology. Dr Mohammed also serves as the Chief of Thoracic Imaging and is the Associate Chairman for Education. He previously served as the Program Director of the Diagnostic Radiology Residency Program. Dr Mohammed completed his undergraduate degree at Meharry Medical College in Nashville, Tennessee. He completed residencies in Nuclear Medicine and Diagnostic Radiology at the University of Nebraska. He completed fellowship training in Thoracic Imaging (Cardiopulmonary) at the University of Maryland. Dr Mohammed’s academic achievements, educational contributions, and research accomplishments are substantial. He is an integral member of our leadership team and a valued member of the Department of Radiology.